I sang Disney’s Pocahontas “Colors of the Wind” the entire time I baked these carrot cake cupcakes. Pocahontas came out when I was 9, and my expert critical opinion was that—even if Pocahontas can canoe down rivers, talk to trees, and be besties with a raccoon—she would never be as cool as Belle, the obviously superior Disney princess. Flash forward 18 years: I still believe Belle is the superior Disney princess, still know all the words to “Colors of the Wind” (why? ), and for reasons only the universe can fathom, felt unstoppably compelled to sing it aloud whist baking Loaded Carrot Cake Cupcakes. Perhaps my song sprang from a deep-connection with nature. Perhaps Pocahontas was begging my subconscious to give her a second chance. Perhaps “Colors of the Wind” perfectly encapsulated my bright array of ingredients. Whatever the reason, I nearly named these “Colors of the Wind Carrot Cake Cupcakes.” Then, I read that name out loud. Plus, I couldn’t betray my homegirl Belle. Loaded Carrot Cake Cupcakes it is! Folks, these are not your mother’s carrot cake cupcakes (and if they are, your mother and I should hang out). I promised “loaded,” and these babies deliver. I set out to make a healthier carrot cake cupcake, so I knew I’d need plenty of shredded carrots for moisture and natural sweetness, but carrots alone were not enough for the tender, flavor-packed cupcake of my dreams. Enter crushed pineapple: a winner for extra moisture, natural sweetness, and all around deliciousness. And what’s pineapple without shredded coconut, my latest-greatest obsession ever since baking this whiz-bang banana coconut cake? Yep, we’re adding it. Next, since this is a carrot cake cupcake after all, we definitely need toasted walnuts and some cinnamon. I omitted raisins (just wasn’t feeling it), but if those plump nuggets are gospel to your carrot cake religion, by all means follow your faith and toss them in too. To bring these baked beauties to carrot cake perfection, I’m keeping it classic with my favorite tangy cream cheese frosting, then adding even more shredded coconut on top. If you’re craving some extra crunch, feel free to toast the coconut first, though the fantastic texture of the cake will stand on its own without this extra step. 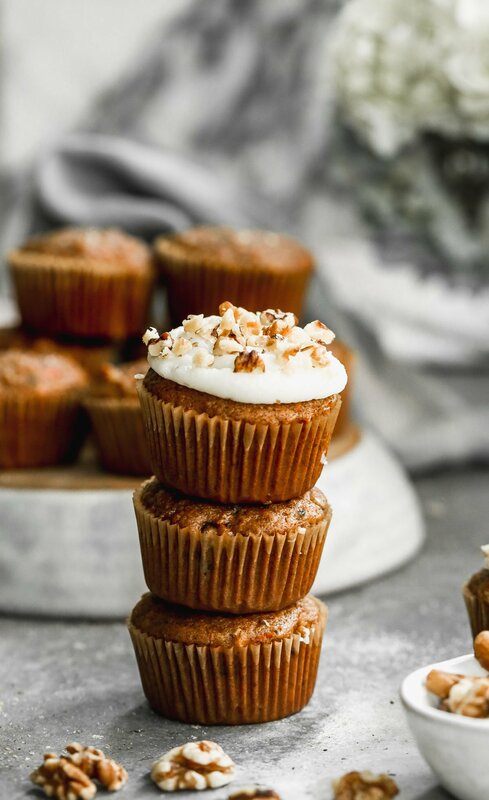 Though Loaded Carrot Cake Cupcakes include some less-traditional ingredients, they stay true to everything you crave about carrot cake that prompts you to bake it first place: natural carrot sweetness, warm spice, and outrageous melt-in-your-mouth moisture. The pineapple enhances the cupcakes’ sweetness and moisture without taking over, and the coconut adds subtle texture. Loaded Carrot Cake Cupcakes might not be your mother’s carrot cake, but I bet you your mother would love every tender, carrot-pineapple-coconut-lovin’-bite. A raccoon told me so. Now, go bake yourself a big batch of Loaded Carrot Cake Cupcakes. Singing is encouraged, and I hope their flavor inspires a little free spirited kitchen boogie. Loaded with natural sweetness from carrots, crushed pineapple, and shredded coconut, these ultra-moist, “skinny” carrot cake cupcakes offer everything you love about carrot cake—tender texture, lovely carrot flavor, and subtle, warm spice—without the guilt. Top with tangy cream cheese frosting and extra shredded coconut for the full Loaded Carrot Cake Cupcake experience. Preheat the oven to 350 degrees F. Line muffin tin(s) with paper liners or lightly coat with cooking spray. Set aside. In a medium bowl, stir together the all-purpose flour, whole-wheat flour, baking soda, cinnamon, and salt. Set aside. In the bowl of a standing mixer or a large mixing bowl, beat together the egg, egg whites, brown sugar, and canola oil. Add the carrots and beat for 1 minute. Add the pineapple and 3/4 shredded coconut and beat until incorporated. With a wooden spoon, stir in half of the flour mixture, just until incorporated. Stir in buttermilk. Add the remaining flour mixture, continuing to stir in by hand, just until combined. Gently fold in walnuts. Fill prepared tins 3/4 of the way with batter. Bake 20-22 minutes, until a toothpick inserted into the center comes out clean. Gently remove cupcakes from tin and let cool on a wire rack. Meanwhile, prepare the Coconut Cream Cheese Frosting, leaving the coconut untoasted (if desired). Spread frosting on cooled cupcakes, then top with remaining 3/4 shredded coconut. Serve and enjoy! Store frosted cupcakes in the refrigerator for up to 5 days or freeze unfrosted cupcakes for up to 2 months, first wrapping each individual cupcake tightly with plastic wrap. Your story is so cute! I could totally see myself doing something like this. I love thinking of old memories as I bake/cook! Loving these cupcakes, especially all that coconut on top! These cupcakes are totally calling to me, Erin! Carrot cake is my favorite ever, ever, ever. Love your coconut cream cheese frosting, too! Carrot cake is just the bees knees! Thanks Georgia! These look and sound delicious! I love carrot cake and appreciate how much healthier you have made these. Beautiful pictures of them as well! Kind of funny, this IS prety similar to my family’s carrot cake! Your version is definitely healthier, but I never knew that all carrot cakes didn’t have pineapple (and was always sad when I discovered no coconut tucked away in others). In my opinion, these are musts and make the cake perfection — so your cupcakes look amazing! P.S., totally played “Colors of the wind” at a piano recital when I was young, so if you need back up music then I’ve got you covered! Love that song! And these cupcakes are loaded and luscious!!! Love them. Loaded and luscious! I lovvvve that description. Thanks Ashely! Oh I was singing all of the songs from the little mermaid the other day. Where does those brain cells go? I am all for a healthier carrot cupcake…we could call that a muffin, which is automatically healthy right? I love the addition of the coconut on top. You can call these whatever you like and eat them for breakfast too! They do have all those fruits and veggies afterall ;-) Thanks for your comment! Belle is my FAVORITE. Though I do have a soft spot for Pocahontas and her love of the nature (and the fact that she has a cute raccoon as a best friend, which is awesome). Going to have to bust out my old school Disney soundtrack while I make these yummy cupcakes! Belle is seriously the best. Love the idea of dusting off hte Disney soundtrack, but I’m pretty sure mine are all on cassette tapes! haha. Thanks Steph! I love the coconut! Carrot cake rocks, it’s the only treat my husband can’t resist! It’s the opposite over here. I’m the one that could eat dessert after a huge dinner and can go for pretty much anything. I have to fight the wife to try something or to let me make it. She’ll love it once it’s made of course, but getting there is the journey. Haha, I’d be lying to you if I said I didn’t know all the words to Colors of the Wind. I tried to read through this quick so I wouldn’t accidentally get the song stuck in my head. It always makes me tear up (I know, dude.. food blogger.. tearing up for Disney songs.. my man card has been gone a long, long time). Anyway, the cupcakes sound amazing with the pineapple and coconut. Sound perfect for a bbq or outdoor party. I love them but I’ve never made a carrot cake. Pretty sure yours might be the first! lol. This cracked me up. Belle is an odd ball (I can relate), smart (I hope to relate), and she falls for the Beast because of who he is on the inside vs. love at first site (the romantic skeptic in me can relate). How can that not MY food-blogging heart? And no judgement for crying during Colors of the Wind–I honestly bawled when I saw Pocahontas in theater. Did I mention I’m a sap? Sally, you know the formula for a moist cake :) Cheers for Pocahontus. Can’t lie–I kind of want to rewatch it now! Your logic is GENIUS! Yay for Disney and hope you had a great trip! These cupcakes are amazing! Thanks for a great recipe. I will definitely make these again! Hi Erin, I am the law student’s mother!!! Always looking for something nice to make for my son while he’s in the library and I don’t have to convince you that’s all the time. Can’t wait to try your loaded carrot cupcakes and check out other recipes in your blog. Thank you.